Ranger is a Canadian Park Ranger who discovered a strange rock in the same mountain Lightfoot's father found the ore he made a prototype car out of. He was contacted by Godmaster Ginrai, Pretenders Metalhawk and Lander and the Cybertron Headmaster Juniors who suspected the rock was a Transector. 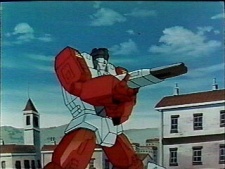 He was given a set of Master Bracers by Ginrai and became a Godmaster when they were attacked by the Destron Headmaster Juniors and Godmasters.